Travel to Milan to discover the 'alternative' Italy, for the city embodies everything that is chic and sophisticated in Italian culture, far removed from quaint Tuscan villages or warbling gondoliers. Milan is the home of haute couture and haute cuisine, world-class shopping, supreme opera, elegant skyscrapers, tasteful galleries and museums, and spacious piazzas. The proud denizens of this city seem to do everything with style and they know how to have fun: Milan has an energetic nightlife and a sophisticated clubbing scene. Fashion fundis, shopaholics, opera-lovers and anyone who enjoys the finer things in life (and can afford to pay for them) will revel in a holiday in Milan. This is not to say there are no archaeological or historical treasures in the city; sightseers searching out the ancient and historic will find plenty of diversions. Art-lovers are drawn to Milan to see the masterpieces stored in its leading galleries and the piece de resistance, da Vinci's The Last Supper fresco, is in the refectory of the Santa Maria delle Grazie. Mid-summer (July and August) is stiflingly hot and humid in the city, and most locals head for the lakes at this time of year. The best time to holiday in Milan is in early summer (May to June), or early autumn (September), when the weather is warm and sunny. Winters are very chilly, wet and foggy. Read more on Milan's Climate and Weather. - Marvel at the breathtaking Duomo di Milano, the world's largest Gothic cathedral. - See Leonardo da Vinci's legendary designs and inventions in the National Science and Technology Museum. - Seek out the peaceful beauty of the old botanical gardens at Orto Botanico di Brera. - Gaze upon da Vinci's The Last Supper in the UNESCO-listed Santa Maria delle Grazie. - Visit the fascinating Basilica of Sant'Ambrogio, one of the oldest churches in Milan. - Explore the vast Sforzesco Castle, one of the city's most iconic monuments. - Catch an opera at the world-famous La Scala Theatre. - Wander through one of Italy's finest art collections at the Pinacoteca di Brera. There are many enviable excursions from Milan: the stunning scenic villages of Cinque Terre are within easy reach; the glamorous playground of Portofino attracts many day-trippers; and the beautiful Dolomite Mountains beckon to outdoor enthusiasts. Venice and Genoa are also close enough to encourage quick visits. Flights to Milan most commonly land either at Milan Linate International Airport, five miles (8km) southeast of central Milan, or Milan Malpensa International Airport, located 28 miles (45km) northwest of Milan. Despite its distance from the city Milan Malpensa is one of the busiest airports in Europe and buses, trains and taxis ferry passengers into the city. Get more information on Airports in Milan. - Milan is considered one of the most expensive cities in the world. - The famous Milan Cathedral took nearly four centuries to complete. 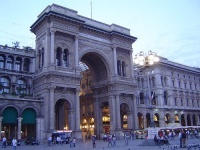 - Milan has been ruled by Celts, Romans, Goths, Lombards, Spaniards, and Austrians in its long history. Sophistication reaches new levels in Milan. The financial and commercial centre of Italy, Milan attracts fashion fundis, opera lovers, the young, the beautiful and the bold. Shopping, eating and clubbing is serious business here - and it is no surprise that the city boasts the world's 'most beautiful shopping mall', the Galleria Vittorio Emanuele II. Equally vying for admiration are the Milanese icons of La Scala Theatre (Teatro della Scala) and the Gothic Duomo, one of the world's largest churches. Milan's frenetic pace surges ahead in its drive towards progress, forsaking the lengthy siestas enjoyed in other parts of the country. The city's urban tentacles stretch for miles, although the significant historical attractions are contained between the two landmark sites - the Duomo and the Sforzesco Castle. These reside within the inner loop of the city's concentric design, which is split into four squares: Piazza Duomo, Piazza Cairoli, Piazza Cordusio and Piazza San Babila. The modern civic centre lies to the northwest, around Mussolini's colossal train station built in 1931. The skyline around here is dominated by skyscrapers from which the sleek Pirelli Tower emerges. The Fiera district that stretches around Porta Genova station is the hub for trade and fashion fairs.